Content provided by the Finnish space research community and associated government institutions. This document is the digital version of the bi-annual report of Finnish Space Research, prepared by the Finnish National Committee to the Committee on Space Research (COSPAR). The report describes Finnish space activities, introduces research organizations participating in space activities, and highlights a few of the scientific, applied, and technological developments during the 2016 - 2018 period. During the first century of independent Finland (since 1917), the country has undergone major technological advancements to include capabilities to build space-qualified instrumentation and complete satellite systems. At the time of writing, in summer of 2018, the first Finnish satellites Aalto-1 and Aalto-2 are already in orbit, we are eagerly waiting for the launch of Finland’s centenary jubilee CubeSat, Suomi 100 (Finland 100). These low-cost, student driven missions continue to be valuable technology development platforms and offer learning experiences for students while bringing novel scientific results. Archival copies of this report and previous reports are available at http://cospar.fi/reports.html. Space matters by nature involve multiple sectors, and thereby cross administrative boundaries. The perspectives of various ministries and agencies are brought together by the Finnish Space Committee, which operates under the Ministry of Economic Affairs and Employment. The membership of the Finnish Space Committee covers relevant ministries and main actors, and is nominated by the Finnish government for a term of three years. The Space Committee makes proposals and gives statements on matters related to space research, education and industrial development, exploitation of knowledge derived from space activities, and national and international cooperation. Especially, the Space Committee deals with issues related to Finnish activities under the auspices of the European Space Agency. With private space activities increasing and developing, a clear need emerged for legislation laying down a framework ensuring the lawfulness, safety, and business opportunities related to space activities. The Finnish Act on Space Activities and the complementing Decree of the Ministry of Economic Affairs and Employment on Space Activities entered into force in January 2018. The new Act establishes the national authorization process for space activities as well as the national space object registry. The Ministry of Economic Affairs and Employment maintains the space object registry and acts as the authority for authorization. The objective of the national legislation is to create a predictable and legally transparent environment for national space activities and to ensure the safety of the activities as well as the sustainable use of outer space. The current Finnish Space Committee was nominated in March 2016. The Committee meets 2 to 3 times per year, its Secretariat more frequently. A current list of the Finnish Space Committee members can be found at Ministry of Economic Affairs and Employment. The Committee is chaired by Under-Secretary of State Petri Peltonen from the Ministry of Economic Affairs and Employment. Increase volume of space industry through specialization. While success has been achieved in all fronts during the first two years of the strategy period, the international space activities scene is rapidly evolving: New business opportunities have emerged, often based on the much-improved navigation and positioning capabilities or on the increasingly affordable small spacecraft technologies. Thus, a working group has been set by the Minister of Economic Affairs and the Minister of Transport to address possible new measures to enhance growth and employment through space applications and space data. The working group members come from administration, research and industry. Business Finland coordinates and offers financial support for participation in international technology initiatives, including European Union’s Horizon 2020, COST and EUREKA, the research activities of International Energy Agency, European Space Agency, and Nordic cooperation. Business Finland fosters new technologies, product development, and business development of various areas, and offer opportunities for collaboration between companies, universities, and research institutes. In 2017, Business Finland’s total financing for national and international R&D&I-projects was 510 million euros. Business Finland is a new organization, founded 1 January 2018 by merging Tekes (financing organization for applied and industrial research and innovation), and Finpro (export promotion agency). Business Finland operates under the Ministry of Employment and the Economy, and receives its funding from the state budget. Business Finland targets to renew industries, increase added value and productivity, and boost exports, thereby generating wellbeing and improving the employment market. To that end, Business Finland offers technology and innovation funding and global export promotion. In 2017, Business Finland allocated 16.2 million euros to European Space Agency programs. In March 2018, Business Finland launched a New Space Economy program, which will fund space activities with a broad scope during the next five years. Academy of Finland’s mission is to fund high-quality scientific research, provide expertise in science and science policy, and strengthen the position of science and research in Finland. The Academy of Finland operates to reform, diversify, and internationalize Finnish research. To that end, the Academy of Finland supports and facilitates researcher training and research careers, internationalization and the utilization of research results. The importance of research impact and breakthrough research is emphasized. The Academy of Finland programs cover the full spectrum of scientific disciplines. In 2017, Academy of Finland funding for research amounted to 441 million euros. The Academy’s research funding schemes include several instruments, for both individual researchers and research organizations. The Academy of Finland is an agency within the Ministry of Education and Culture. The Academy of Finland research funding granted to space research and astronomy has been stable at around 3 million euros annually. In addition, the Academy of Finland Center of Excellence program funds two centers in space research: Professor Kalevi Mursula’s Solar Long-Term Variability and Effects (2014-2019) and Professor Minna Palmroth’s Sustainable Space (2018-2025). The Academy of Finland funds also Finnish participation in ground-based space instrumentation: The Finnish Research Infrastructure Committee of the Academy of Finland granted 12,8 M€ for construction of EISCAT_3D ionospheric radar; the construction phase started in 2017. Membership fees to international organizations (ESO, NOT and EISCAT) total some 3 million euros annually. In October 1958, the International Council of Scientific Unions (ICSU) established the Committee on Space Research (COSPAR) to “provide the world scientific community with the means whereby it may exploit the possibilities of satellites and space probes of all kinds for scientific purposes, and exchange the resulting data on a co-operative basis.” COSPAR aims to advance the progress of scientific research carried out with space vehicles, rockets, and balloons in all fields of research. The international scientific community targets the COSPAR objectives through ICSU and its adhering National Academies and International Scientific Unions. Operating under the rules of ICSU, COSPAR is unbiased by political views and considers all questions solely from the scientific viewpoint. The Finnish National Committee of COSPAR has taken part in the international and national co-operation of scientific space research since 1964 by submitting proposals, issuing statements, arranging meetings, and keeping contact with the international COSPAR and its subcommittees. In addition to bi-annual reports provided to the Council at the General Assemblies, the Committee organizes biannual national FinCOSPAR Meetings in years between the international general assemblies. The last national meeting was held in August 2017 in the island of Seili in the Turku archipelago. The National Committee of COSPAR is an expert body under the auspices of the Delegation of the Finnish Academies of Science and Letters. The members of the National Committee represent the active community of space researchers in Finland. The current members of the National Committee can be found at http://www.cospar.fi/members.html. The space technology education program at Aalto University developed the first Finnish national satellites using the CubeSat technology. Following the successful launches of two first student-built spacecraft in 2017, the Academy of Finland selected a space technology-oriented consortium in its highly competitive Center of Excellence program. The Sustainable Space consortium aims at development and launch of three small missions during the 8-year project. At the same time, several space-related startups have been spun out of these activities, and the first private sector satellite launch has taken place. Occurred and tentative Finnish satellite launches are given in the table below. Finnish space activities span scientific research, space-based environmental monitoring, telecommunications, navigation, as well as space technology and application development. The backbones of the Finnish space research are memberships in the European Space Agency (ESA) and the European Southern Observatory (ESO). In addition to opportunities offered by these organizations, Finnish space sector is widely networked with international space organizations, research institutes and universities as well as private industries and service providers. Increasingly, collaborative efforts under the auspices of the European Union and European organizations offer both research and industrial opportunities. PI of SIXS, participation in MIXS (X-ray instruments), participation in SERENA particle instrument. Finland participates in the development of technologies for ESA future missions in the mandatory Basic Technology Research Programme (TRP), General Studies Programme (GSP) and in the optional General Support Technology Programme (GSTP). Furthermore, Finland participates in the DEBIE micrometeoroid and space debris monitor on the International Space Station. ESA GSP, TRP and CPT are part of ESA’s mandatory funding. General Studies Programme (GSP), Basic Technology Research Programme (TRP) and Core Technology Programme (CTP; part of the Science Programme) all focus on early development of technologies for ESA space missions. The projects are often studies by spacecraft prime contractors, leaving smaller players only few such projects. In TRP Finnish companies have recently developed e.g. radiometers and radio altimeters. ESA General Support Technology Programme (GSTP) is an a-la-carte technology programme that develops many technologies, including spin-outs from the space segment to other applications. Projects aim at technology readiness levels (TRL) near market entry. The imaging spectrometer for Aalto-1 nanosatellite was developed by VTT as an ESA technology project. ESA ARTES 1, 3, 4, 5 and 20 (IAP) is a family of satellite telecommunications programmes. ARTES 1 focuses on strategic studies, while ARTES 3 and 4 develop the user segment (e.g. terminals used on ground) and ARTES 5 concentrates on the satellite segment. ARTES 20, also called Integrated Applications Promotion (IAP), develops applications that use satellite remote sensing, navigation and telecommunications as well as various ground-based sensors for applications in e.g. healthcare, security of nuclear power stations, maritime use, and wind energy applications. Finland runs the IAP ambassador platform for Baltic Sea applications, in which the first projects started in 2012. ARTES 5 has demonstrated its usefulness e.g. in the field of composite structures. ESA European GNSS Evolution Programme (EGEP) develops satellite navigation technologies. To a large degree, it focuses on next generation flight segment of Galileo and EGNOS, but also targets science and applications of the Global Satellite Navigation System. Within this programme, the University of Oulu has studied C-band signal satellite-to-indoor propagation, Finnish Geodetic Institute has studied use of EGNOS in urban navigation and Finnish Meteorological Institute has studied ionospheric monitoring. ESA Earth Observation Programme Envelope Programme (EOEP) fosters commercial applications in its Value Added Element among other activities. ESA GMES Service Element programme (GSE) was a pre-runner for European Commission’s GMES projects. Global Monitoring of Environment and Security (GMES) programme develops capabilities and solutions to global environmental and security issues. Finnish projects are related to air, water (seas, lakes, snow, ice), and forestry. Aalto University, Finnish Environmental Institute and Finnish Meteorological Institute participate e.g. in the Polarview project. ESA European NAVISP programme supports innovation development in satellite navigation technologies since 2017. It follows ESA EGEP programme but in entirely focused on applications for the Earth. The European Southern Observatory (ESO) is a globally significant intergovernmental science and technology organization in astronomy. ESO operates three unique and world-class observing sites in the Atacama Desert in Chile: La Silla, Paranal and Chajnantor. La Silla is equipped with several optical telescopes with mirror diameters up to 3.6 meters. The Paranal site hosts the Very Large Telescope array (VLT), the flagship facility of European astronomy. VLT is an array of four telescopes each with a main mirror of 8.2 meters in diameter. The Atacama Large Millimeter/submillimeter Array (ALMA) comprises an array of 66 12-meter and 7-meter diameter antennas. The next step beyond the VLT is to build the European Extremely Large optical/infrared Telescope (E-ELT) with a 39-meter primary mirror and planned start of operations in 2024. The Finnish Centre for Astronomy with ESO (FINCA) carries out and co-ordinates Finnish high quality research in fields of astronomy with European Southern Observatory (ESO), and promotes technological development work related to ESO. FINCA participates in researcher training and promotes co-operation of Finnish universities in astronomy. FINCA membership includes all Finnish universities with a major astronomy/astrophysics program: Aalto University, University of Helsinki, University of Oulu, and University of Turku. FINCA researchers make use of the available observing time at ESO facilities, Finnish use being roughly in proportion to the Finnish participation in the program. FINCA hosts permanent staff as well as time-limited researcher, post-doctoral, and graduate student positions. FINCA also has a short-term visitor program, organizes summer schools and courses, and coordinates Finnish representation at ESO. Since 2010, FINCA researchers have produced over 500 publications. FINCA’s ultimate goal is to improve the scientific and industrial benefit of Finland's membership in ESO, and Finland's international competitiveness in astronomical research as well as to promote high-quality ESO-related research. FINCA is funded by the Ministry of Education and Culture, and by the participating universities (Turku, Aalto, Helsinki and Oulu). FINCA is participating on behalf of the Finnish community in two ESO’s ELT instrument consortia, MOSAIC (optical and near-infrared multi-object spectrograph), and MICADO (near-infrared adaptive optics imager). FINCA is also participating in NOT Transient Explorer (NTE), a new instrument capable of simultaneous optical and near-infrared spectroscopy and imaging, with first light expected in late 2019. As a follow-up to NTE participation, and to build a bridge toward involvement in ESO instrumentation, FINCA is also participating in a next generation instrument to the ESO 3.5-m New Technology Telescope (NTT), the Son Of X-Shooters (SOXS), a very similar instrument to the NTE, by contributing the calibration unit subsystem. FINCA received in 2017 a five-year research infrastructure grant from the Academy of Finland to enable participation in these instrument projects. FINCA is also involved in the ESA’s Euclid near-infrared space telescope being responsible for the Euclid Data Quality Common Tools. The European Incoherent Scatter Scientific Association (EISCAT) has been established to conduct research in the terrestrial atmosphere and ionosphere by means of incoherent scatter radars. EISCAT association members are Finland, Norway, Sweden, UK, Japan and China, while Russia, France, South Korea and Ukraine have an associate status. The radar facilities are located in Tromsø, Kiruna, Sodankylä and on Svalbard. During 2016-2018, Finnish researchers have made several measurement campaigns in international collaboration. Topics range from magnetospheric and ionospheric physics (energy transfer from the magnetosphere to the ionosphere, interplanetary planetary scintillation (IPS) by the solar wind, pulsating aurora, optical auroral tomography, D-region heating and cooling, atmospheric physics (atmospheric gravity waves), to technology development (development of quadriphase-coded incoherent scatter experiments, validation for beacon satellite tomography in LEO/TomoScand), and coordination with ESA’s SWARM satellite measurements for investigating ionospheric electrodynamics. All the measurement campaigns have utilized the extensive space physics related ground-based measurement networks in Finland. The next-generation upgrade of EISCAT, EISCAT_3D, will be realized as a phased array. The new radar will have a transmitter/receiver in Norway (Skibotn), and receiver sites in Finland (Karesuvanto) and in Sweden (Kiruna). The key concepts of the facility are volumetric vector measurements, great flexibility, altitude coverage from the upper troposphere to the base of the magnetosphere, and continuous measurements. With funding decisions from Norway, Sweden and Finland, construction of the radars commenced in 2017. The Finnish EISCAT community has actively taken part in planning and designing the EISCAT_3D. EUMETSAT is a global operational satellite agency with the purpose to gather accurate and reliable satellite data on weather, climate and the environment and to deliver them to members, international partners, and to users around the world. Finland became a member of the organization in 1986. Finnish EUMETSAT activities include active participation in the service development especially through the Satellite Application Facility program. The Finnish Meteorological Institute has a strong role in production of satellite data and long observational time series. The near-real-time services produced by FMI are used to monitor e.g. the changes in the ozone layer and volcanic eruptions. The International COSPAS-SARSAT Programme is a satellite-based search and rescue distress alert detection and information distribution system, best known for detecting and locating emergency beacons activated by aircraft, ships and backcountry hikers in distress. Finland became a member of the programme in 2010. The European Union funds space and remote sensing research through the European Commission Framework Programme, the Environment programme, and the European Research Council. Under the auspices of the EU Framework Programmes, the FP7 had a dedicated Special Programme for Space funding space science, satellite remote sensing and satellite technology development. Within the space theme, Finland was part of 44 projects selected for funding, being the leader in 9 projects. The follow-up Horizon 2020 programme started in 2013 has yielded 21 project participations for Finland in four separate calls. Finland has received three ERC grants focused on space research and astronomy, Minna Palmroth for development of a global space weather simulation (Vlasiator, starting grant) and for using it to study space weather phenomena (consolidator grant), and Emilia Kilpua for studying solar flux ropes (consolidator grant). Finland has participated in all large GMES projects such as MACC (atmosphere), MyOcean and Geoland, which will become Copernicus core services after 2014. University-level space education comprises MSc and PhD programs in space research and technology offered at several universities including an international Erasmus Mundus Space Masters program. The doctoral education at universities of Helsinki, Oulu, Turku and Aalto University operates in a network that fosters student mobility and organization of joint summer schools and other educational activities. The basic space research has been substantially strengthened by the decision of the Academy of Finland to allocate three Centers of Excellence in the fields of long-term solar variability (ReSoLVE CoE; lead: University of Oulu), sustainable use of space (FORESAIL, lead: University of Helsinki), and in laser scanning (CoE-LaSR; lead: National Land Survey/Finnish Geospatial Research Institute). Due to its favorable location, Finland has long traditions to operate ground-based instrumentation to observe the space environment: Finland hosts one of the European Incoherent Scatter Radar Facility (EISCAT) radars in Sodankylä and one of the Super-Dual Auroral Network radars in Hankasalmi. In addition, Finland leads an international consortium (MIRACLE - magnetometers, ionospheric radars and all-sky cameras large experiment) focusing on monitoring of ionospheric processes and their magnetic signatures on ground. Astronomy and astrophysics is supported by memberships in international ground-based telescope organizations, the Nordic Optical Telescope (NOT) and the European Southern Observatory (ESO). The Finnish Centre for Astronomy with ESO (FINCA) acts as a national research and coordination body for astronomers, and the Metsähovi Radio Observatory is part of wide international VLBI measurement networks. Space research at Aalto University spans the School of Electrical Engineering (Aalto-ELEC), School of Science (Aalto-SCI) and School of Engineering (Aalto-ENG). Activities at ELEC cover radio astronomy, plasma physics of planetary and Earth space environments, Earth observation by remote sensing methods, and small satellite technologies. Aalto-ENG covers GPS techniques, photogrammetry and remote sensing. Aalto-SCI activities focus on solar and stellar dynamo processes and the development of related numerical methods and data analysis tools, extending the space science and astronomy to a new realm of astroinformatics. In the past few years, three new professors have been recruited and two new Academy of Finland -funded Centers of Excellence started operation at Aalto. Renewal of faculty has strengthened earlier research areas and expanded activities to cover new fields. Aalto MSc and PhD majors offer a full curriculum in space science and technology. Aalto is the only university offering a major in space technology. Aalto space activities are nationally and internationally networked. National partners include the capital area research organizations, most notably University of Helsinki, the Finnish Meteorological Institute, and the VTT Technical Research Centre of Finland, as well as the Universities of Turku, Helsinki and Oulu under the auspices of the Finnish Centre for Astronomy with ESO (FINCA). Technology collaboration with the European Space Agency (ESA) has strengthened by the location of the ESA Business Incubation Centre (ESA-BIC) in the premises of the Aalto startup center A Grid. The Metsähovi Radio Observatory hosts several radio telescopes dedicated to radio astronomical measurements. The largest telescope (14 meters), previously used for coordinated observations with ESA’s Planck mission, focuses on long time series of active galaxy variability and solar activity. It is also used in several networks to make high-resolution VLBI observations and dedicated geodetic VLBI measurements, as well as for high-precision tracking of spacecraft. Smaller telescopes are dedicated to solar monitoring. Nanosatellite technologies have been developed in two CubeSat missions Aalto-1 and Aalto-2, both successfully launched during 2017. The first spinoff focused on commercial services in the Arctic region has successfully launched and operates its first satellite. The the student satellite program continues to train multi-disciplinary engineers capable of designing, building, testing and operating spacecraft and its instrumentation under the auspices of the newly started center of excellence Sustainable Space. The satellite projects are conducted in wide national collaboration. Space physics research covers topics ranging from space weather and space climate at Earth to plasma environments around solar system bodies. The work ranges from instrument design and building to satellite and ground data analysis and numerical modelling of space plasmas and their interactions with solar system bodies. Aalto is involved in European Space Agency missions such as Rosetta, Mars Express, Venus Express, and the upcoming BepiColombo and JUICE, and European infrastructure road maps projects EPOS and its national counterpart FIN-EPOS. The modelling tools serve as state-of-the-art interpreters of the complex interactions between solar wind particles and the studied solar system object. Combination of satellite data analysis and numerical simulations target key space physics questions such as plasma and energy transfer across plasma boundaries (especially reconnection) or interaction with planetary atmospheres especially pick-up ions). Long-term studies on magnetic disturbances in the Sun, solar wind and ground are proceed within centre of excellence ReSoLVE and geoscientific infrastrcuture G-EPOS. Geomagnetic data since mid-1800´s together with the space data since mid-1900´s are analyzed to better understand the Sun-Earth magnetic coupling. Remote sensing research focuses on development of methods and microwave sensors for space-borne monitoring of Earth surface, especially phenomena typical of the northern boreal forest and sea ice. The photogrammetry and remote sensing activities cover dynamic phenomena of the environment through space borne, aerial, and terrestrial sensing systems. Methodology development includes electromagnetic imaging systems, especially their radiometric and geometric calibration. These multisensory imaging methods are applied to dynamic environmental modeling and geographic visualization of local and global physical phenomena. Aalto is also part of the Academy of Finland Center of Excellence in Laser Scanning Research. Studies of the Earth's space environment focus on one hand on the long-term variability of the solar activity and space climate, and on the other hand on the short-term response of the space environment to the variable solar wind driving force. The long-term variability studies are conducted in collaboration with the University of Oulu, under the auspices of the ReSoLVE Center of Excellence. The Aalto activities focus on modeling the solar dynamo including both centennial and decadal variability, as well as on long-term variability of the geomagnetic activity, while the Oulu activities complement these by examining the larger-scale heliospheric processes. Space environment studies have taken a major step forward, as the GUMICS-4 global magnetohydrodynamic simulation has been installed and is actively used for research at Aalto. Studies include examination of energy transfer from the solar wind through the plasma boundaries to the near-Earth space environment, and the corresponding dynamic processes and variability that occurs both in the magnetosphere and in the ionosphere. Recent focus of the studies has been on the critical role of the Mach number of the incoming solar wind flow in the capacity of the magnetopause to shield the energy flux. 3D view of a GUMICS-4 simulation showing plasma number density in pseudocolor, plasma flow streamlines in blue and magnetic field lines in yellow. Earth is depicted as white dot tailward from the bow shock and the magnetosheath (bright yellow). shows 3D view of a GUMICS-4 simulation showing plasma number density in color-coding, plasma flow streamlines in blue and magnetic field lines in yellow. Earth is depicted as white dot; the bow shock and the magnetosheath can be identified as the bright yellow marking higher density. The cross-polar cap potential (CPCP) as a function of the interplanetary electric field Y component (EY) in GUMICS-4 (see Lakka et. al. 2018 for the details of the study). Red (blue) dots represent data points for which the solar wind Alfven Mach number MA is larger (lower) than four. Both the colour of the points and the response of the CPCP on EY changes at EY=5 mV/m and suggests that the CPCP saturates with a dependence on the solar wind MA. The cross-polar cap potential (CPCP) as a function of the interplanetary electric field (EY) in GUMICS-4 (Lakka et. al. 2018) for solar wind Alfvén Mach numbers MA larger (red) and smaller (blue) than four. The figure suggests that the polar cap potential response to driving solar wind electric field saturates with a dependence on the solar wind Mach number. Global hybrid modeling of solar wind interactions with solar system objects is carried out by the space research group at the School of Electrical Engineering of the Aalto University in collaboration with the Finnish Meteorological Institute. The focus in the modeling work is on space physics and space weather phenomena and planetary and cometary plasma physics. Especially, we study Earth and Mercury, i.e. planets with strong intrinsic magnetic field and the magnetosphere, and the induced magnetospheres and ion erosion of comet 67P and Mars and Venus. A hybrid plasma simulation of the Hermean magnetosphere. shows an example of a global 3-dimensional hybrid model simulation of the Hermean solar wind interaction. Coloring on the polar plane gives a snapshot of the solar wind proton number density. The increase of the density at the bow shock is seen in bright yellow. Lower densities (black and magenta colors) are found in the Hermean magnetotail. Magnetic field lines are shown near the ecliptic plane. Upstream of the bow shock the field lines are mostly oriented along the undisturbed interplanetary magnetic field (IMF) vector, which has a strong flow-aligned component due to the 17 degree Parker spiral angle. The field lines drape around Mercury’s magnetosphere downstream of the bow shock. In the northern cusp region the IMF is found to connect with the intrinsic planetary magnetic field. Coloring on the field lines shows the north-south component of the magnetic field, which is perpendicular to the undisturbed IMF. Strong foreshock fluctuations are evident ahead of the quasi-parellel region of the bow shock. A comparison between a global hybrid simulation of the Martian plasma environment and multi-spacecraft observations. Jarvinen R., Brain D.A., Modolo R., Fedorov A., Holmström M., Oxygen ion energization at Mars: Comparison of MAVEN and Mars express observations to global hybrid simulation, J. Geophys. Res., 123, 1678-1689, http://dx.doi.org/10.1002/2017JA024884, 2018.
shows an example of a comparison of a global 3-dimensional hybrid simulation of the Mars-solar wind interaction with multi-spacecraft observations on the Mars Express and MAVEN orbiter missions at Mars (Jarvinen et al., 2018). Oxygen ions escaping from the Mars upper atmosphere through the heavy ion plume experience strong finite larmor radius effects, which is seen in the spacecraft ion spectrometer measurements as well as in the model. Simulation illustrating the effect of different cometary ion production processes around the comet 67P/Churyumov-Gerasimenko. Streaming content. demonstrates the relative impacts of different physico-chemical processes around the comet 67P/Churyumov-Gerasimenko. Aalto team has developed a comprehensive 3D numerical space plasma model, which enables studies of cometary space plasma environment and its response to varying solar wind conditions. Especially, the team evaluated the atmospheric loss rate of the 67P/CG and its dependence on the distance from the Sun. Solar data from SOHO, SDO and ground-based facilities such as Metsähovi and other ground-based telescopes are analysed to better understand the complex structure of the solar active regions and their variability over the solar cycles and grand minima and maxima. The Sun - Earth magnetic coupling is studied by the modern tools of machine learning, statistics and data analytics. The evolution of solar wind over the decades and its effect to the magnetospheric dynamics is studied by the satellite and ground-based data. Magnetic activity in the magnetosphere and on ground was found to be strongly driven by the external conditions in yearly and monthly time-scales. High-speed streams and embedded magnetic fluctuations are found to best modulate magnetic disturbances at the high latitudes. Solar wind Alfvénic fluctuations are found throughout the solar cycle but most strongly they power geomagnetic activity in the declining solar cycle phase. The known rapid increase of geomagnetic activity in 2003 is reported to be related to the transition from Alfvénic fluctuations being embedded in slow solar wind until 2002 and in fast wind after that (Tanskanen et al., 2017a). The yearly occurrence of the solar wind Alfvénic fluctuations within slow solar wind (< 400 km/s) and fast solar wind (> 600 km/s). The yearly solar wind speed is shown by a green line. Geomagnetic activity varies in time-scales from seconds and minutes to years and solar cycles. The seasonal variation of high-latitude geomagnetic activity has been recently found to closely follow the solar wind speed. The seasonal pattern of the high-latitude geomagnetic activity is modulated by the solar wind structure in addition to the equinoctial mechanism, heliographic latitude and the Russell-McPherron effect. Geomagnetic activity maximizes, on average, around the two equinoxes in spring and fall. Although the two-equinox pattern in geomagnetic variation is seen in multiyear averages, only one fourth of individual years since 1966 show this pattern. For the rest of the years, the two peaks in geomagnetic activity are seen purely during solstice months or as an equinox-solstice combination. The rare winter dominance in geomagnetic activity is reported for the declining phase of the solar cycle 23. That is found to be due to the elongated coronal holes in the southern solar hemisphere. Tanskanen et al., 2017b. Rapid geomagnetic fluctuations are known to be closely linked to the high-latitude geomagnetic activity such as pulsations and substorms. There are latitudinal differences on magnetic fluctuations amplitude and fluctuation coverage. Midnight hosts most fluctuations below and noon above 72 deg. geomagnetic latitude. Latitudinal differences are larger in fluctuations coverage than in fluctuations amplitude. The largest differences in seasonal variation between midnight and noon are seen in the polar cap. Peitso et al., High-frequency geomagnetic fluctuations at auroral oval and polar cap, accepted to Space Weather, 2018. Latitudinal variation of geomagnetic fluctuation coverage from 65 to 85 Mlat. The fractional derivative rate (FDR) measures the portion of the time that is covered by the magnetic fluctuations exceeding 0.2 nT/s. The largest fluctuation coverage below 72 GMlat is at midnight and above 72 GMlat at noon. Geomagnetic activity has been monitored at high, mid and low-latitudes for more than a century by ground-based magnetometers. A new concept of small magnetometers, CubeMAG, has been developed enabling the detection of magnetic field disturbances at exosphere by small satellites and under water by seafloor magnetometers. The Sun, aside from its eleven year sunspot cycle, is additionally subject to long-term variations (such as the Gleissberg cycle which manifests itself as amplitude modulation of the basic cycle) and irregular disruptions (such as the Maunder minimum) in its activity. The astroinformatics group at Aalto-SCI has made a huge computational effort to capture such behavior in global-scale convection dynamo simulations. The first ever solar-like solutions, covering a few magnetic cycles with the toroidal magnetic field showing clear equatorward migration in low latitudes and a poleward branch at higher latitudes, were obtained in wedges of compressible turbulent magnetoconvection by the group members in 2012 (Käpylä et al. 2012, ApJL, 775, 22). These models have since that time been extended considerably in time to be able to investigate the solutions on a scale of a millennium in solar time units (Käpylä et al. 2016, A&A, 589, 56, the “Pencil-Millennium” simulation). Our longest model produced so far covers 200 magnetic cycles, and reveals extremely complex behavior, including multiple dynamo modes, strong short-term hemispherical asymmetries, and epochs of disturbed and even ceased surface activity. Surprisingly, the most prominent epoch with suppressed surface activity (see , 25-50 yrs) is actually a global magnetic energy maximum; during this epoch it is particularly the bottom toroidal magnetic field, which reaches a maximum, demonstrating that during grand-minima-type events the magnetic field can be hidden in the deep parts of the convection zone, making the interpretation of such events non-trivial. Time-latitude diagram of the azimuthally averaged toroidal magnetic field near the surface (upper panel) and at the bottom of the convection zone (lower panel), from Käpylä et al., 2016a. Metsähovi Radio Observatory, located 30 km west of the Otaniemi campus, is the only radio-astronomical observatory in Finland. The primary instrument is the 14-metre radio telescope, used mainly for observing the Sun and extragalactic radio sources (so called quasars), and for international very long baseline interferometry (VLBI) campaigns. The main products are the data collected with various radio telescopes and other instruments. Observations are carried out on a “24/7/365” basis, and observing time is scheduled for 97 % of the hours of the year. Metsähovi Radio Observatory primary 14-metre telescope during daytime observations. Video by Metsähovi: Niko Lavonen and Niko Kareinen; streaming content. The backbone of the Metsähovi observing programme is the very long timescale monitoring of quasars (a special type of radio-loud active galaxies), whose data sets, going back to early 1980s, are among the most extensive and best sampled in the world. Similarly, radio maps of the Sun have been made in Metsähovi since 1978. A solar radio map at 37 GHz. Photo: Merja Tornikoski, Metsähovi Radio Observatory. One of the by-products of our solar studies (three different observing systems, various wavelength ranges) is the study of space weather, which has some impact on everyday life on Earth. Also studying water in the solar system or gaining information about our planetary system by spacecraft tracking experiments that we participate in, give us more information about the conditions in our own Solar system. The vast majority of the data is used for scientific research by researchers and research groups around the world. In a typical year, 50-60 users (65 % of them from abroad) use Metsähovi data for roughly 120-160 peer-reviewed publication. Most of the use is astronomical, but e.g. the VLBI measurements enable also extremely accurate positioning and distance measurements. For this reason, the Finnish Geospatial Research Institute (FGI) leases the 14-metre telescope and MRO’s technical staff for their own research and services. Metsähovi staff participates in teaching space science and technology (B.Sc., M.Sc. and doctoral levels, as well as LuMa activities with high schools, and public outreach). Because MRO is the only radio astronomy observatory in the country, courses and students from other universities use Metsähovi for their own hands-on education. In addition to course and project work, the staff at Metsähovi also supervise thesis work in various fields. Metsähovi is currently preparing for major infrastructure upgrades. During the next few years we will replace the protective radome of the 14-metre radio telescope, upgrade the main receiver to allow for simultaneous multifrequency observations and participating in new international Very Long Baseline Interferometry networks, as well as rebuild significant portion of the premises. Finally, we are looking into possibilities to better support the growing Finnish nanosatellite ecosystem by providing ground station and downlink services. An international team has made ultra-high angular resolution images of the black hole jet at the centre of the giant galaxy NGC 1275, also known as radio source Perseus A or 3C 84. The researchers were able to resolve the jet structure ten times closer to the black hole than what has been possible before with ground-based instruments, revealing unprecedented details of the jet formation region. A schematic figure of interferometric observations with RadioAstron. http://www.aalto.fi/en/current/news/2018-04-03-004/. An international research team with heavy involvement from Finland found an peculiar gravitational lense that magnified the supermassive black hole jet in a distant active galaxy. The lense, estimated to be a star cluster weighting about 1000-10000 solar masses in a spiral galaxy between the Earth and the and the active galaxy, was found in the radio monitoring data of the Owens Valley Radio Observatory (Caltech) and Metsähovi Radio Observatory (Aalto). Finnish Environment Institute SYKE is both a research institute, and a center for environmental expertise under the Ministry of Environment. SYKE is responsible for carrying out environmental research, monitoring and assessment, publishing and disseminating the results, and maintaining the appropriate information systems. As a national center of environmental information, SYKE provides expert services and takes care of diverse statutory tasks. There is a strong emphasis at SYKE on providing support to the decision-making process, including scientific and technical advice and through the development of methods to combat harmful environmental changes. The Data and Information Centre of SYKE compiles and manages data systems, provides technical support and training on information technology, harmonizes and develops SYKE international reporting, and deals with other centralized aspects of data management. In addition, the center is responsible for the development of the Finnish Environmental Administration geographic information systems (GIS) and Earth Observation (EO) information systems. The EO research and development concentrates on operational monitoring of snow cover, water quality, land use, land cover and phenology. The research includes validation of EO products with in-situ observations. Additionally, theoretical and experimental research on the optical characteristics of water, snow and land cover is performed in cooperation with national and international partners. The customers of SYKE are researchers in environmental administration, governmental and municipal authorities, general public and private industry. Data are also delivered to the international research community in collaborative projects and upon requests. During 2016-2017 the EO research and development at SYKE has concentrated on the utilization of the Sentinel satellites of the EUs Copernicus programme for environmental monitoring and dissemination of EO based information. This includes development, testing and validation of algorithms, development of efficient data storage and processing facilities, and publication of results through openly available data interfaces and map applications. The Finnish Meteorological Institute is a governmental research institute responsible for the national weather service in Finland. It is the largest space research organization with about 50 staff working in space research and 50 staff on Earth observation. FMI is known for its scientific modeling capabilities including meteorological, climatic, and space plasma models and simulations. FMI expertise in space instruments dates back more than three decades and includes instrumentation for planetary atmospheres and plasma environments and general solar system research. FMI has a competitive record of building space instruments for planetary, space research and Earth observation purposes, gathering and analyzing data, developing theoretical models for data interpretation, and publishing the results in leading peer-reviewed journals. The northern location of Finland is optimal for monitoring space weather phenomena with ground-based instrumentation. In collaboration with the University of Oulu FMI operates networks of magnetometers, auroral cameras and Beacon receivers whose data are used both in research and services. The services include contributions to the ESA Space Situational Awareness program and the national 24/7 service for global natural hazards located at FMI. In research FMI’s main interests are in ionospheric tomography, near-Earth particle environment modelling and magnetosphere-ionosphere coupling processes. The institute has a long record in development of MHD simulations where the goal for the terrestrial plasma simulations is to build an operational code for ensemble runs and 24/7 operations. The FMI Arctic Space Centre operates in Sodankylä Northern Finland using cutting-edge technologies, developing techniques and leveraging its northerly location, to provide understanding of Earth's environment, developing services and infrastructure for society and the international community. The Centre’s three satellite antennas are used mostly for downlinking Earth Observation satellite data from spacecraft to Earth. The Arctic Space Centre also operates National Satellite Data Centre (NSDC) that is a central hub of providing and disseminating satellite data to Finnish users. The main data set NSDC distributes is the free and open Copernicus Sentinel data from all currently orbiting Sentinel spacecraft. Electron density variations are strong particularly in the Arctic ionosphere, where the variability is not controlled just by solar illumination but also by particle precipitation. Arctic region poses therefore an extra challenge for applications that rely on radio wave propagation in or through the ionosphere. Instead of statistical electron density models ray-tracing codes would need information on real, three-dimensional variations in the electron density. FMI and the Sodankylä Geophysical Observatory have developed a computationally efficient statistical tomography method, called TomoScand (http://space.fmi.fi/MIRACLE/tomoscand/), for regional volumetric imaging of ionospheric electron density. As advancement to previous similar tools, the priors for the TomoScand inversion can be parametrised with physical units and understood as a probability distribution for realistic electron density profiles. In addition, comparisons of prior and posterior distributions provide an easy way to distinguish the regions of large uncertainties in the results. TomoScand inversion is able to process electron density information from several different measurement concepts. The primary input data sources are Global Navigation Satellite Systems (GNSS) with their dense receiver networks and the Finnish network of ground-based receivers for Beacon signals (150 and 400 MHz) from Low Earth Orbit satellites. Occasionally available in-situ electron density measurements by space-based Langmuir probes (e.g. on-board the ESA Swarm mission) can be utilized in the reconstructions, as well. shows an animation of TomoScand results and time evolution of the measurements that have been used in the reconstructions. Validation of the TomoScand outputs with EISCAT Incoherent Scatter Radar measurements (Norberg et al., 2016) have demonstrated the capability of the new tool to provide electron density estimates consistent with the radar measurements. TomoScand can therefore be considered as a useful extension for the future EISCAT_3D system. An animation of the receiver network, data points and results of statistical ionospheric tomography above Scandinavia. FMI scientists have been part of the NASA Curiosity Rover science team and provided atmospheric pressure and humidity devices for the Curiosity mission. These devices were also used in correlation studies when Curiosity found evidence that methane in the Martian atmosphere has seasonal variation. Higher concentrations appear in late summer and early autumn in the northern hemisphere and lower concentrations in the winter and spring. After having monitored the Martian atmosphere for two full Martian years (five Earth years), it can be concluded that the annual average concentration of methane in Mars’ atmosphere is 0.41 ppb. The seasonal variation of methane abundance seems to range from 0.24 ppb in winter to 0.65 ppb in summer. Also high methane spikes up to about 7 ppb occurring randomly were detected. Methane could be produced through geologic or biologic processes, but the source still remains a secret. A plausible explanation for the methane seasonal variation is suggested to be slow seepage from an underground reservoir varied by seasonal changes of solar heating of the surface. Seasonal variation of the average amount of methane in the Martian atmosphere. Reference: Webster, C. et al., Background Levels of Methane in Mars' Atmosphere Show Strong Seasonal Variations, Science, 8.6.2018. http://science.sciencemag.org/content/360/6393/1093. The greenhouse gas emissions are driving the climate change which affects strongly the societies and political decision making. Reduction in uncertainties related to natural carbon cycles and global monitoring of greenhouse gas emissions, both natural and anthropogenic are urgently needed. Global satellites time series provide information that can be used to better understand regional changes and to quantify their effect globally. Finnish Meteorological Institute (FMI) is on of the leading institutes in developing and utilizing satellite remote sensing to study the cryosphere. The unique ground-based reference site hosted by FMI and located in Sodankylä provides ground truth for numerous satellite missions. Joint analysis of satellite and ground-based data has recently resulted in new findings related to increased carbon uptake in boreal regions due to earlier spring recovery. This work was published in the PNAS journal (Pulliainen et al, 2017, PNAS). Another highlight by FMI satellite remote sensing group is the development of a analysis method to detect emission regions of carbon dioxide globally using solely satellite observations. This methodology was applied to NASA’s OCO-2 satellite’s observations of carbon dioxide and have resulted so far two highly valued publications (Hakkarainen et al., GRL, 2016 and Eldering et al, Science 2017). From Eldering et al, Science, 2017. Maps of the OCO-2 XCO2 anomaly (mean in each grid box of the daily anomaly from the regional median) in 1° by 1° cells between September 2014 and April 2016.The anomalies are only plotted for the regions identified as clusters of enhancements due to fossil fuel burning. The Dutch-Finnish Ozone Monitoring Instrument launched in 2004 on-board NASA’s EOS-Aura satellite has turned out to be highly successful mission with exceptionally stabile performance and low instrument degradation. The scientific use of the data is increasing along with the growing time series and the OMI observations have opened new possibilities for applications, thanks to the operational, near-real-time or quasi-near-time services, running also at the National Satellite Data Centre in Sodankylä. Such services include e.g. monitoring volcanic emissions and other air quality episodes. During the last years, specific activities have taken place to support in increasing amount the societal needs related to utilizing and benefitting from the satellite data, e.g. to support environmentally sustainable solutions. This has resulted in closer collaboration with FMI and authorities, ministries, cities, industry and general public. The recently published overview paper of OMI summarizes the 14 years of OMI observations and research findings and demonstrates the societally important application areas including air quality monitoring, trends, air quality forecasting, pollution events, top-down emission estimates and support for Montreal protocol (Levelt et al., 2018, ACP). From (Levelt et al, ACP, 2018). OMI mission averages (2004–2016) for NO2 (a), absorbing aerosol index (AAI; b), HCHO (c), and SO2 (d). Total ozone column (O3; e) and surface UVB amount (f) are shown for 24 September 2006, the day with a record size ozone hole. The Finnish Geodetic institute (FGI) was merged into the National Land Survey of Finland 1.1.2015, with the new name Finnish Geospatial Research Institute (FGI). The Finnish Geospatial Research Institute (FGI) is a research and expert institute that carries out research and development for spatial data infrastructures. The FGI provides a scientific basis for Finnish maps, geospatial information and positioning and carries out research and development on methods for the measurements, data acquisition, processing and exploiting of geospatial information. The strategic research areas of the FGI are Spatial Data Solutions Supporting Digitalisation, Dynamic Earth, Smart Environments and Interaction and Robotics and Intelligent Transportation Systems. Metsähovi geodetic research station of the FGI is a part of global network of geodetic core stations within the Global Geodetic Observing System (GGOS), and Finnish contribution to the UN General Assembly 2015 resolution on global geodetic reference frames for sustainable development. It is one of the few stations in the world having all major space geodetic observing techniques at the same site: Satellite Laser Ranging (SLR) system (since 1978), GNSS receivers (since 1991), French DORIS beacon (since 1994), geodetic Very Long Baseline Interferometry (VLBI) system (since 2004), in addition to several gravity instruments (since 1994). Being one of the northernmost stations, it contributes to several global services of the International Association of Geodesy (IAG). Started in 2012, all major instruments have been renewed, the last ones the SLR to be completed in 2018 and a VGOS (VLBI Geodetic Observing System) radio telescope. Due to the increasing demands for e.g. GNSS satellite tracking and following the recommendation by the Satellite Laser Ranging Service (ILRS), a modern kHz-capable SLR system is being built. The new system includes a fast 0.5m telescope with a 2kHz laser as the light source housed in a modern observatory building with an automated dome. It can track both low orbit Earth exploring satellites and navigation satellites like European Galileo for enhancement of their orbits. The VGOS system consists of a 14-m dish radio telescope to be used 24/7 for geodetic VLBI. Telescope will be built in 2018 and planned to be operational 2019. As a part of global network, observations are used for determining the Earth orientation in space and maintenance of global reference frames, both vital for use of navigation satellites. FGI performs various research related to the abovementioned space geodetic techniques. FGI is developing techniques to observe satellite tracks and rotation states by active SLR and passive optical measurements. This is used, in addition to geodesy, to identify satellite types, to pick out-of-control-cases, to map space debris, and to predict risks for falls and collisions. New GNSS receivers at Metsähovi and the permanent Finnish GNSS network FinnRef allow tracking of all navigation satellite systems. The network is bases of the national reference frame, and it will be expanded from 20 stations to 50 stations in 2018. The freely available correction signal enables navigation of 0.5 m accuracy everywhere in Finland, and the usage of a precise mode, down to a few centimeters is studied. Data are submitted to the EUREF Permanent GNSS network (EPN) and further to EPOS (European Plate Observing System) data base. In an Academy of Finland -funded ALBEDO project FGI/GEOGEO is, together with University of Helsinki, developing novel techniques for estimating the Earth's time variable albedo from Earth's radiation pressure forces experienced on satellites. Especially navigation satellites are investigated in this context since their orbits are well known. Another GNSS-related application has been the partially EU-funded project FAMOS Odin (Finalising surveys for the Baltic motorways of the sea), where the foundation is laid for high accurate vessel navigation in the future. Gravity and GNSS surveys were carried out in the Baltic Sea on the research vessels Aranda and Geomari to validate and improve geoid models in the area and test the use of future GNSS augmentation services in vessel navigation. Finnish Geospatial Research Institute (FGI) has been an active member of the EU COST action SaPPART (Satellite Positioning Performance Assessment for Road Transport, 2013-2017). One of the aims of the SaPPART action was to develop a framework for definition of service levels for the GNSS-based positioning terminals, used in Intelligent Transportation Systems (ITS) and Personal Mobility applications, and the associated examination framework for certification purposes. ITS, and especially emerging automated vehicles, have high demands for positioning performance. Answering these demands is challenging particularly at the Arctic environment, where the availability of the ground based augmentation systems is limited and the performance of the European Satellite Based Augmentation System (SBAS) EGNOS is degraded. Furthermore, the importance of GNSS based positioning increases at the Arctic areas where the existence of snow makes positioning based on optical systems challenging. FGI collaborates with the Finnish Ministry of Transportation and Communications in the ARKKI project (https://arkki-project.org/) funded by the Finnish Ministry of Foreign Affairs to identify the most significant challenges that are faced in navigation and geospatial information based applications in Arctic areas and will propose a roadmap to recommend Pan-Arctic solutions to the identified challenges. FGI’s project Arctic Positioning Navigation and Timing Innovation Platform: Nordic Hub based on the SNOWBOX Infrastructure (Arctic-PNT https://arctic-pnt.org/), funded by the European Space Agency (ESA), identifies and analyzes the role of Finland’s Aurora SNOWBOX as a key infrastructure in the Nordic Hub of the Arctic PNT Innovation Platform, especially with regards to positioning and navigation needs for autonomous driving in Arctic conditions. During the project, experiments assessing the Positioning, Navigation and Timing (PNT) performance of GNSS at the Arctic areas will be conducted. These experiments will provide real-world evidence on the capabilities, as well as challenges, of SNOWBOX as a PNT Innovation Platform and more generally as an Arctic test ecosystem for innovation in the field of autonomous driving. Arctic driving conditions at Aurora Snowbox during Arctic-PNT position data collection campaign. Serious consideration should be given to the effects that would be posed to society if GNSS were to face widespread disruptions. Virtually every segment of society and industry would be negatively impacted. What many people fail to realize is that GNSS provide not only positioning services but also precision timing services. While both are critically important in modern society, the importance of timing services to critical infrastructures, such as power distribution systems, is severely overlooked. FGI, Tampere University of Technology, Aalto University, and University of Helsinki collaborate in an Academy of Finland project INSURE (https://insure-project.org/), creating (1) beyond state-of-the-art knowledge for improving robustness of GNSS receivers against jamming and spoofing, (2) advanced methods for improving user privacy and information security in non-GNSS positioning, and (3) legislative solutions in terms of policy and regulatory recommendations for improving the privacy of end-user data exchanged in location-based services. Furthermore, FGI is a member of a consortium carrying out research around this important topic in an EU Horizon2020 project Strike-3 (http://www.gnss-strike3.eu/) developing international standards in the area of GNSS threat reporting and GNSS receiver testing for safety, security, governmental and regulated applications. An international GNSS interference monitoring network has been deployed and operated by the project to capture the scale and dynamics of the problem. As a result and through work with international stakeholders, the project will develop, negotiate, promote and implement standards for threat reporting and receiver testing. Researchers and specialists working at Luke provide new solutions towards the sustainable development of the Finnish bioeconomy and the promotion of new biobased businesses. Together with its partners, Luke will build a society based on bioeconomy. This is done in four research programmes, concentrating on forests (Boreal Green Bioeconomy), food production (Innovative Food Systems), fisheries (Blue Bioeconomy), and societal ascpects (BioSociety). In addition to research programmes, Luke also carries out statutory government work. We monitor natural resources, certify plant production, inspect control agents, store genetic resources, produce data on greenhouse gases, support natural resource policies and produce Finland’s official food and natural resource statistics. The volume of work in Luke was in 2017 about 1300 person years, including about one person year of work on satellite-based remote sensing. In addition to this, several person years of work is done on airborne remote sensing and terrestrial laser scanning. New nation-wide products are currently made every second year. The latest forest resource maps, describing the forests in 2015, were published in 2017, and the corresponding municipality statistics in 2018. The results are freely available. MS-NFI products are employed as input information in forest management planning by forestry authorities and for timber procurement planning by forest industries. Furthermore, the results have been used in ecological studies, e.g., in analyzing the quality of the habitats of key-stone species, for assessing the habitat and landscape values for nature conservation planning, and for other research purposes, and also in planning sampling designs. An example of the forest resource maps from MS-NFI-2015. The red colour channel is the volume of birch, the green channel the volume of pine, and the blue channel is the volume of spruce. They grey areas are not forest. The map overlay is based on the National Land Survey of Finland Topographic Map 2016. The MS-NFI method is under continuous development to decrease the estimation errors at different spatial levels and to increase the temporal accuracy. In the current method, the estimates are made to describe the forest resources as accurately as possible at a target date (July 31, 2015 for the latest published products). New satellite sensors are used as they become available. The Sentinel-2A and 2B satellites have increased the availability of images with sufficiently low cloud cover during one growing season. Only one usable Sentinel-2A image was available for the 2015 product, but more will be used for the 2017 product. The field data is updated from field work dates to the target date. This includes using growing models and finding large changes (usually clear-cuts) between the field work date and the image date. The MS-NFI team is firmly established in the field of forest remote sensing. The MS-NFI method has been successfully tested or employed also outside of Finland. Its variation is in use Sweden and USA. Examples of other countries with collaborative work are Austria, China, Germany, Ireland, Italy, New Zealand, Norway, and Poland. Space research at the University of Helsinki is carried out mostly at the Department of Physics. Furthermore, the Department of Geosciences and Geography is active in analysis of meteorite materials and utilizes space facilities in geoinformatics. The newly established Institute of Atmospheric and Earth System Research (INAR) uses remote sensing data in climate and weather research. The multidisciplinary environment includes materials researchers involved in planetary geophysics, and the particle physics and astrophysics community cover a continuum from particle cosmology, observational cosmology, astrophysics, planetary research, and space environments of the Earth and planets. Space activities comprise at the beginning of 2018 about 60 FTE, of which some 50 FTE are in astronomy and space physics. We produce annually about 100 peer-reviewed articles. Two most important national organizational frameworks are the Finnish Centre for Astronomy with ESO (FINCA) and the Kumpula Space Centre in collaboration with the Finnish Meteorological Institute (FMI) and the School of Electrical Engineering of Aalto University. In planetary research we have active co-operation with the Finnish Geospatial Institute (FGI) of the National Land Survey of Finland. While strategic focus is in ESA and ESO activities, research utilizes observations from a variety of international observatories and spacecraft through collaboration and utilizing open databases. Particularly in training of new generation of space researchers, smaller-scale facilities are very useful, one important tool being the Nordic Optical Telescope. We also contributed to Aalto University’s student satellite Aalto-1’s radiation monitor in collaboration with University of Turku and plasma brake in collaboration with FMI. Very important progress took place in 2017. From the beginning of the year the development of the world-wide unique space plasma simulation tool Vlasiator moved from the FMI to the University when Minna Palmroth started as a professor in computational space physics. A major success was the inclusion of the Centre of Excellence in Research of Sustainable Space, FORESAIL, in the CoE programme of Academy of Finland, 2018 – 2025. The UH led consortium has partners from Aalto University, University of Turku and FMI. Our space research is also the most successful in Finland in terms of ERC funding. At the end of 2017 our researchers had one Advanced Grant (Karri Muinonen) and two Consolidator Grants (Emilia Kilpua and Minna Palmroth). Our research activities include interstellar medium and star formation, extragalactic astrophysics, cosmology, stellar astrophysics, solar activity and its consequences on planetary environments, terrestrial planets and small solar system bodies, as well as planetary geophysics. In studies of the interstellar medium our focus is in the early stages of the star formation process. Here we use observations from the ground (e.g., ESO’s telescopes) and the satellites (e.g., ESA’s Herschel and Planck). In theoretical extragalactic research we study the formation and evolution of galaxies using both numerical simulations performed on high-performance computing facilities and analytical calculations. Our research in cosmology forms a seamless continuum from theoretical particle cosmology to space-based utilization of Planck observations where our team has contributed to the core of data analysis of cosmic microwave background observations. In planetary research our focus is on the orbital determination, shape, structure, and composition of asteroids and comets, e.g., by using the observations by the revolutionary ESA Gaia space mission, as well as the surface regolith, atmospheres and magnetospheres of solar system bodies. With establishment of the new Centre of Excellence our space physics activities are now organized under its umbrella. The scientific emphasis is on Solar-Terrestrial relations, including both solar processes driving the space weather phenomena and the near-Earth response to them. The FORESAIL CoE is preparing for three CubeSatellites during its funding period focussing on radiation belts, controlled re-entry of satellites and electric sailing outside of the magnetosphere. Our major contributions to future large space missions are the Solar Intensity X-ray and particle Spectrometer (SIXS), together with the Mercury Imaging X-ray Spectrometer (MIXS), onboard the Mercury mission BepiColombo by ESA and JAXA, to be launched in 2018, and the participation in the Science Ground Segment of ESA’s dark energy mission Euclid, to be launched most likely in 2022. Our experimental high-energy astrophysics scientists have pursued a Finnish participation in ESA’s planned X-ray satellite Athena. There is also a strong interest in the future space-based gravitational wave observatory LISA. UH has a leading role in the development of a new state-of-the-art model that describes the debiased orbit and absolute-magnitude distributions of near-Earth objects (NEOs). The modelling has already revealed a statistically significant lack of NEOs on orbits with small perihelion distances which implies that NEOs are virtually completely destroyed at non-trivial distances from the Sun (Granvik et al. 2016; Nature 530, 303–306). The primary physical mechanism causing the disruption is still to be determined but observational and theoretical work has been initiated to allow testing the various scenarios put forward so far and to guide the formulation of alternative explanations. When the physical mechanism is understood in detail, the disruption close to the Sun can most likely be utilized to constrain the interior composition of asteroids, a key knowledge gap in planetary science. Much like solar flares, substorms occurring within the Earth's magnetic domain are explosive events that cause vivid auroral displays. Substorms are unpredictable, violent events that can even lead to loss of spacecraft and other space weather events. A decades-long debate exists to explain the substorm onset, which has been associated with either three-dimensional plasma instabilities and/or magnetic reconnection. Using the novel Vlasiator modelling tool, the University of Helsinki researchers devised a simulation encompassing the entire near-Earth space and demonstrated that detailed modelling of magnetic reconnection explains the central substorm observations. These results help to understand the unpredictable substorm process, which will significantly improve space weather forecasts. Vlasiator hybrid-Vlasov simulation of the noon-midnight plane under southward IMF, plasma density and magnetic field lines are shown. Streaming content. Space-related research in the University of Oulu is conducted in the Space Climate Research Unit, in the Ionospheric Physics Research Unit, in the Astronomy Research Unit, and at the Sodankylä Geophysical Observatory. Research areas include space climate and space weather research, solar effects on atmosphere and climate and other solar-terrestrial connections, ionospheric and magnetospheric physics, cosmic rays, astronomy, and planetology. About 50 researchers are working in these units, including 5 professors and almost 20 PhD students. Space Climate Research Unit (SCRU) concentrates on the long-term change (years to thousands of years) in solar magnetic fields and their effects in the whole heliosphere, including the near-Earth space, atmosphere and climate. Space climate has, during the last 10 years, grown to a central focus area in space physics, a topic of collaboration at the widest international level, e.g., within the VarSITI (Variability of the Sun and Its Terrestrial Impact) program of SCOSTEP (Scientific Committee on Solar-Terrestrial Physics). Space Climate Research Unit is one of the main originators of space climate and has had a leading role from the start of this field. SCRU has one of the widest research programs in Space climate research in the world. SCRU hosts the Centre of Excellence on Research on Solar Long-term Variability and Effects (ReSoLVE, http://www.spaceclimate.fi/resolve/) funded by the Academy of Finland in 2014-2019. This is the first-ever Centre of Excellence dedicated to the space sciences in a broad sense. ReSoLVE is a collaboration of Oulu University and Aalto University. SCRU has been and continues to be actively involved in several international projects, like in the EU FP7 and Horizon 2020 projects (SOTERIA, eHeroes, ESPAS, STORM, SEPServer) and ESF/COST networks (TOSCA, ELECTRONET). The Sun experienced a dramatic burst of activity during the early 20th century, from a low level of 100 years ago to an all-time maximum (so called Grand Modern Maximum; GMM) around 1960, and a recent decline back to a low level. SCRU uses all ground-based (WSO, MWO, KP, SOLIS) and satellite (SOHO/MDI, SDO/HMI) measurements of the solar magnetic field and spectral line observations at several observatories in order to study this exceptional period of the Sun. SCRU has also launched an international team working on this topic within the International Space Science Institute. SCRU is involved in the future satellite programs measuring the solar magnetic field, in particular in ESA L5 satellite program. The hemispheric (north-south) asymmetry of solar magnetic fields has been studied by several different methods over several decades. These studies have led to the conclusion that the northern and southern solar hemispheres are connected, but not very tightly. The overall level of magnetic activity is not very different in the two hemispheres but, due to the different timing and distribution of activity, the asymmetry can be considerably large over the solar cycle. We have studied the long-term evolution and the north-south asymmetry of photospheric and coronal magnetic fields and the heliospheric current sheet (HCS) using synoptic maps of the photospheric magnetic field from all the six magnetographs available (Wilcox Solar Observatory, Mount Wilson Observatory, Kitt Peak, SOLIS, SOHO/MDI and SDO/HMI). We found that all the six data sets agree on the southward shift of the heliospheric current sheet in the declining to minimum phase of the solar cycle, verifying the so called bashful ballerina phenomenon. During solar cycles 20 - 22, the HCS southward shift is due to the axial quadrupole term, reflecting the stronger magnetic field intensity at the southern pole during these times. However, during cycle 23 the asymmetry is mainly due to higher harmonics than the quadrupole term. This further emphasizes the special character of solar magnetic fields during solar cycle 23. Heliographic latitude (λh) of the HCS in the solar corona (13-rotation running means) derived for six magnetograph datasets using their measurements of the photospheric field and the PFSS model. All datasets agree on that the mean latitude over the 40-year time interval is negative, indicating a dominantly southward shifted HCS, i.e., the bashful ballerina phenomenon. The shift is larger in the declining phase of the early strong solar cycles (in 1980s and 1990s) and weaker during the more recent weaker cycles. All data from all datasets is shown in the figure, including the known erroneous intervals in KP and WSO, during which the shift is either exaggerated (KP in 1976, 1985-1989), or negated (WSO in 1995-2001). Ref: Virtanen, I.I. and K. Mursula, Photospheric and coronal magnetic fields in six magnetographs: I. Consistent evolution of the bashful ballerina Astron. Astrophys., 591, A78, doi:10.1051/0004-6361/201628096, 2016. Disturbances of near-Earth space are predominantly driven by coronal mass ejections (CMEs) that mostly originate from sunspots and other active regions, and high-speed solar wind streams (HSSs) that emanate from coronal holes. We studied the relative importance of CMEs and HSSs in producing energetic electrons in the Earth’s magnetosphere by utilizing the corrected energetic electron fluxes from the MEPED instrument on board low-altitude NOAA/POES satellites from 1979 to 2013. Using solar wind observations categorized into different flow types, it was possible to separate the contributions of these flows to electron precipitation and to quantify their efficiencies in producing precipitation. We found that HSS contribution nearly always dominates over the CMEs and peaks strongly in the declining solar cycle phase. Surprisingly we also found that the efficiency of both HSSs and also CMEs peaks in the declining phase. Solar wind speed was found to be the dominant factor affecting the precipitation in all solar wind flow types. Since HSSs enhance the average solar wind speed in the declining solar cycle phase, they also accelerate CMEs to higher speeds and thus enhance the efficiency of CMEs during these times. High-speed solar wind streams have thus have a dual effect in enhancing energetic electron precipitation. 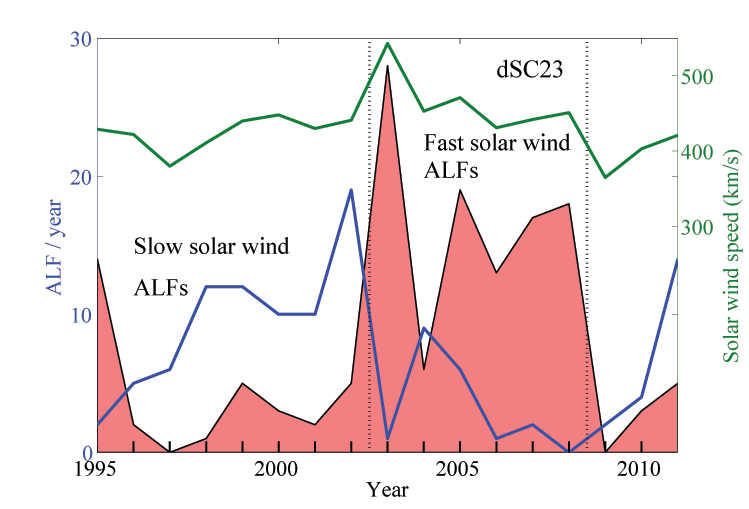 Annual contributions of CMEs (red curve), HSSs (blue curve), and slow/unclear solar wind (green curve) to the total electron fluxes (black curve). Thick (thin) curves represent fluxes computed by including (excluding) the data points with missing solar wind data. The error bars for the thin curves indicate the standard error of mean for the annual contributions taking into account serial correlation between successive data points in the orbital time resolution (errors for the thick curves are closely similar). Gray shading indicates the sunspot cycle. Panels from top to bottom represent the three integral energy channels indicated in panel titles. Ref: Asikainen, T., Ruopsa, M. , Solar wind drivers of energetic electron precipitation, J. Geophys. Res., 121, doi:10.1002/2015JA022215, 2016. Solar energetic particles (SEP) affect the Earth's atmosphere and environment, in particular by destroying the ozone layer in the Earth's atmosphere. They also pose technological hazards for satellites and even threaten the health of space and aircraft crew. The strongest observed solar particle storm occurred on 23-Feb-1956. A similar storm now would harm or even kill astronauts if there were some on orbit. The greatest SEP storm known from indirect proxy records covering the whole Holocene (the time after ice age) occurred in 774-775 AD, serving as a worst-case scenario for SEPs. It was 40-50 times stronger than any directly observed SEP event. We have made a systematic analysis of the impacts that such an extreme event can have on the Earth’s atmosphere. Using cosmic ray cascade and chemistry-climate models, we reproduced the observed variability of 10Be cosmogenic isotope around 775 AD in four ice cores from Greenland and Antarctica. We showed that such a severe event is able to perturb the polar stratosphere for at least one year, leading to regional changes in the surface temperature of up to several degrees during northern hemisphere winters. Atmospheric effects due to the SEP event on 01-Sep-774 (day 244) from modelling. Panels A through D: NOx, O3, zonal wind (U) and temperature (T) anomalies, respectively, averaged over the northern polar region (70–90°N for NOx, O3 and T and 50–70°N for U) and averaged over 30 ensemble members. Zonal wind changes are shown as 20-day running means. Colored areas are significant at a 95% confidence level. Panels E, F: Monthly mean surface air temperature (SAT) changes (K) in December 774 AD and January 775 AD due to the event. The orange contours indicate significance at the 95% confidence level. Dashed lines mark 40°N and 70°N latitudes. Ref: Sukhodolov, T. I.G. Usoskin, E. Rozanov, E. Asvestari, W.T. Ball, M.A.J. Curran, H. Fischer, G. Kovaltsov, F. Miyake, T. Peter, C. Plummer, W. Schmutz, M. Severi, R. Traversi, Atmospheric impacts of the strongest known solar particle storm of 775 AD, Sci. Rep., 7, 45257, doi:10.1038/srep45257, 2017. Sunspot numbers provide a uniquely long index of solar activity spanning over 400 years. However, they are still subject of intense debate, with the largest uncertainty being related to the visual acuity of individual observers in the past. We have presented a novel method for calibrating the acuity of the key solar observers in the 18th and 19th centuries to the reference data set of Royal Greenwich Observatory sunspot groups for the period 1900 – 1976, using the statistics of the active-day fraction. Correction matrices were constructed for each observer using the Monte-Carlo method, and applied to the original sunspot group records reported by the observers for each day. Finally, the composite corrected series was produced for the period since 1748. The new group sunspot number series is close to the "classical" group sunspot number by Hoyt and Schatten, but essentially lower than the recent reconstruction by Svalgaard and Schatten, suggesting that the latter overestimates early sunspot activity. Our results confirm the uniqueness of the Grand Modern Maximum of the 20th century during the last 250 years, at least. Monthly series of sunspot-group numbers obtained by individual observers after corrections for the observational imperfectness (uncertainties are nor shown). Ref: Usoskin, I.G., G.A. Kovaltsov, M. Lockwood, K. Mursula, M. Owens, S.K. Solanki, A New Calibrated Sunspot Group Series Since 1749: Statistics of Active Day Fractions, Solar Physics, 291, 2685-2708, doi:10.1007/s11207-015-0838-1, 2016. The Ionospheric Physics Research Unit studies ionospheric physics and the geospace environment by utilizing different ground-based and satellite measurements. One of the key questions is to understand how space weather phenomena affect the coupled magnetosphere-ionosphere-thermosphere system, producing electric currents and fields in the ionosphere. Rapid changes in electric currents produce ionospheric heating and induced currents on the ground and in technological systems like transformers and pipelines. One of the most important research infrastructures used in ionospheric research is the international EISCAT incoherent scatter (IS) radar facility. With these radars, located on the mainland of Scandinavia and on Svalbard, researchers can study the Earth's ionosphere up to 1000 kilometers. The mainland radars will be replaced by 2022 with the volumetric EISCAT_3D radar facility, with stations distributed in Norway, Sweden and Finland. This will be the world-leading IS radar facility. In addition, the Ionospheric unit utilizes several other ground-based equipment such as all-sky cameras, magnetometers, riometers etc. which are operated by the Sodankylä Geophysical Observatory (SGO) and the Finnish Meteorological Institute (FMI). Satellite missions, e.g., SWARM and Cluster by ESA, play also an important role in our research. Our unit has developed several advanced analysis methods for ground-based and satellite measurements and participated in related international projects. The Astronomy Research Unit (ARU) concentrates on investigating dynamical and physical processes at many different scales, starting from the Solar System and extending to our Milky Way Galaxy and nearby galaxies in general. The extragalactic research focuses on galaxy formation and evolution. ARU is particularly interested in the morphology and mass distributions of local redshift-zero galaxies, representing the endpoints of diverse evolutionary pathways starting from primordial dark matter fluctuations. This approach, called galactic archeology, is capable of answering the question in which level the galaxies formed in mergers of dark matter halos at high redshifts, and to what extent they formed due to slower processes related to internal galaxy evolution, or to interactions with the galaxy environment. The Milky Way Galaxy is a point of reference for the extragalactic work performed in the group. In order to understand the dynamical and star formation processes in other galaxies, knowledge is needed also of our own Galaxy. In the unit, there is an ongoing research of dynamics of binary stars, in particular Cataclysmic Variables, which provides an excellent way to study how stellar evolution is affected due to accretion of gas onto compact objects. The Astronomy Research Unit plays a leading role in the field of galaxy morphology and has a strong background in dynamical N-body modeling, using codes developed in the unit. The group is involved in several international networks, i.e. the Spitzer Survey of Stellar Structure (S4G), the Fornax Deep Survey (FDS), the DAGAL Marie Curie ITN-network, and currently to SUNDIAL, a H2020 Innovative training network. S4G, a legacy Spitzer survey of about 3000 galaxies observed at infrared, is currently the most complete survey of the nearby universe. The ultimate goal of SUNDIAL is to train astronomy/computer science PhD-students to use EUCLID satellite data (totaling several petabytes), which will be the largest extragalactic database in the coming years. The icy crust of Saturn’s moon Enceladus is thinner in the polar regions (left). Between the crust and the porous rocky core there sits an ocean. Water percolating into the core is warmed by contact with tidally heated rock, entering the ocean at hydrothermal vents located beneath the poles. Complex organics entrained in the flow are transported upward to the ice shell, accumulating in rising bubbles of exsolved gases. A thin organic film is created at the oceanic water table inside cracks in the south polar crust (centre). When the bubbles burst (right), droplets of the dispersed organic material become ice-coated when water vapour freezes on their surface, and along with frozen spray of salty ocean water, are ejected in the plumes and then detected by the Cosmic Dust Analyzer on board the NASA/ESA Cassini spacecraft (Postberg et al, Nature, 558, 2018). Modified from https://www.esa.int/Our_Activities/Space_Science/Cassini-Huygens/Complex_organics_bubble_from_the_depths_of_ocean-world_Enceladus. Another focus of the Astronomy Research Unit’s research are small particles found in the environment of the planets of the solar system (circumplanetary dust), which are detected by in-situ instruments on spacecraft. The grains carry information on the physical and chemical conditions at their points of origin, like the surfaces or even the interiors of the moons of the giant planets. For instance, the Cosmic Dust Analyzer instrument on board the Cassini mission at Saturn identified salts in water ice particles expelled from the active Saturnian moon Enceladus, revealing that this icy moon harbors a subsurface water ocean. Moreover, recently the Cosmic Dust Analyzer team reported on the detection of organic macromolecules in the grains from Enceladus (see ). These findings make Enceladus a prime target for future spacecraft exploration, because it may support astrobiological processes and the habitability of the moons of the giant planets is a central theme of the ESA Cosmic Vision programme and the NASA Decadal Survey. Because the dynamics of dust grains is affected by the planetary magnetic fields and the presence of ions and neutral gas, the analysis of the paths of the grains yields information about the environment of the planets. Another motivation for the study of dust around the planets is spacecraft hazard: Impacts of larger particles tend to degrade the hardware of spacecraft and in extreme cases may lead to fatal damage. In this vein, the unit has developed the Jovian Meteoroid Environment Model (JMEM) for the European Space Agency (ESA), which is used in preparation of the ESA mission JUICE that will explore the Jupiter system. The Sodankylä Geophysical Observatory (SGO), located about 120 km north of the Artic circle and 350 km from Oulu, conducts geophysical measurements of the ionosphere, atmosphere, magnetosphere, and solid Earth at 20 different locations in Finland, Sweden, Norway, and Svalbard. The data archive spanning more than 100 years allows studying the long-term evolution of the geospace environment. The Radio Science Laboratory of SGO has a long history of developing innovative measurement methods culminating in the recent construction of Finland’s largest radio telescope, the Kilpisjärvi Atmospheric Imaging Receiver Array (KAIRA). KAIRA is a multi-purpose radio receiver used for atmospheric research and prototyping for the future EISCAT_3D incoherent scatter radar system. SGO has been granted 2,5 million euro of infrastructure funds from the Academy of Finland for the construction of the EISCAT_3D site in Karesuvanto, Finland. These funds are part of a 12,8 million euro allocation of funds by the Academy for the construction of the large international EISCAT_3D distributed incoherent scatter radar. Space research at the University of Turku is conducted at the Tuorla Observatory and the Space Research Laboratory (SRL) both being parts of the Department of Physics and Astronomy. In addition, the University of Turku hosts the Finnish Centre for Astronomy with ESO (FINCA) located at the Tuorla Observatory premises. The total number of staff members and PhD students is about 50. The research at SRL is focused on heliophysics. Alpha magnetic spectrometer (AMS-02) on-board the International Space Station and Energetic and Relativistic Nuclei and Electron experiment (ERNE) on-board Solar and Heliospheric Observatory (SOHO) are the present international SRL experiments delivering data. SRL participates also in future ESA missions: Solar Intensity X-ray and particle Spectrometer (SIXS) on-board ESA's BepiColombo mission will be launched in October 2018. At national level SRL-led RADMON-instrument on-board the Aalto-1 CubeSat has delivered data on energetic protons and electrons in Low Earth Orbit since 2017. Together with the Embedded Electronics research group in the Department of Future Technologies, SRL forms the Instruments team of the Finnish Centre of Excellence in Research of Sustainable Space (FORESAIL), which develops energetic particle instrumentation for three CubeSats to be launched in 2019, 2021 and 2023. Experimental research is supported by numerical model development on energetic particle transport and acceleration in turbulent plasmas and shocks. Energetic electrons and protons have been measured in Low Earth Orbit (LEO) by the RADMON experiment on-board the Aalto-1 spacecraft, Finland’s first satellite in orbit, during the fall-winter period of 2017–2018. The measurements started in September 2017 with observations of the largest solar radiation storms since 2012, which allowed enough data to be gathered to perform the in-flight calibrations of the instrument. After the calibrations were completed, data from the Earth’s radiation belts were collected for more than three consecutive months starting from October 2017. These data have further improved the understanding of the RADMON instrument as well as given an excellent mapping of the radiation environment in LEO. The Figure below shows the fluxes of energetic electrons and protons measured by RADMON in October 2017 – January 2018. The fluxes of inner belt protons show very stable values over the different passes of the South Atlantic Anomaly (SAA), the only region where the inner belt extends to the altitude of the spacecraft (on average 510 km from ground level) due to a local minimum in magnetic field intensity. The outer belt hosts a more variable population of MeV electrons. In addition to trapped electrons, the regions observed by RADMON show populations of electrons which are in the so-called drift loss-cone, where the particles are still mirroring between the end points of the magnetic field but because of their Eastward drift around the globe, are en route to the region below the SAA, where they reach altitudes below 100 km and get absorbed in the atmosphere. Particle fluxes in these regions comprise of highly variable loss-cone events, which the RADMON team has correlated with the simultaneously observed solar wind parameters. We have found that the greatest number of loss-cone events are observed during times, when the interplanetary magnetic field has a south-ward component, leading to efficient energy flow from the solar wind to the magnetosphere. Fluxes of ~2 MeV electrons (blue) and >10 MeV protons (red) measured by the RADMON experiment on-board Aalto-1 spacecraft. The region with elevated proton intensities is the so-called South Atlantic Anomaly, where the inner van Allen belt comes to the altitudes of Aalto-1 (510 km), and the regions with elevated electron intensities around latitudes of ~60° show the tracks of the outer van Allen belt. Tuorla Observatory together with FINCA constitutes the largest astronomical institute in Finland. The main areas of research are high-energy astrophysics, extragalactic astrophysics including active galaxies, supernovae and other transients, and the solar system research. The researchers use multi-wavelength observational data from large ground-based and space telescopes, all the way from radio to gamma-rays. In the reported period 2016-2017, we published about 100 refereed papers per year in the best astronomical and physical journals, including Nature, Nature Astronomy, Astrophysical Journal Letters, Astrophysical Journal, MNRAS, Astronomy and Astrophysics, Rev. Modern Physics, Phys. Rev. D.
The high-energy astrophysics group works on accreting black holes and neutron stars. We work on X-ray bursts and accreting millisecond pulsars in low-mass X-ray binaries containing neutron stars with the aim to determine the equation of state of cold dense matter of neutron stars and to understand the physics of accretion in these objects. We also study X-ray pulsars and ultra-luminous X-ray pulsars, both observationally and theoretically. Here we construct models for the accretion column and for the accretion disc around magnetized neutron stars as well as monitor the sources to study the transition to the propeller regime to measure the neutron stars magnetic field. Another direction of research is accreting black holes of all scales. We modelling of black hole broadband spectra and timing properties both in the optical/infrared and X-rays. We are also doing optical polarimetric studies with the in-house built high-precision Dipol-2 polarimeter with the aim to determine the nature of optical emission. For the super-massive black holes, we study the interaction of the gamma-rays produced in relativistic jets with the photons of the broad-line region with the main goal to determine the location of the gamma-ray emission region. The group uses both ground-based (VLT, NOT, WHT, KVA) and space telescopes (XMM-Newton, RXTE, INTEGRAL, Fermi, Swift, Nustar). We are also involved in preparation for the new X-ray missions being science group members of the NASA’s Imaging X-ray Polarimeter Explorer (IXPE) and Chinese enhanced X-ray Timing and Polarimetry (eXTP) missions. The research interests of the astrophysical transients group range from core-collapse supernovae and their progenitor stars to transients occurring within the nuclear regions of galaxies and most recently also the electromagnetic counterparts of gravitational wave sources. The group makes use of wide field imaging surveys that are producing the detection of thousands of supernova explosions each year as well as other types of astrophysical transients never observed before. The group uses observations at a wide range of wavelengths from radio, optical and infrared to X-rays. For this we use ground-based telescopes, e.g., the ESO VLT and the Nordic Optical Telescope (NOT) as well as data from space telescopes such as the ESA Gaia, NASA Spitzer and ESA/NASA HST and the NASA Chandra X-ray Observatory. The work of the group has focused on studies of core-collapse supernovae and their progenitors and also covered highly energetic superluminous supernovae which are likely powered by a rapidly spinning strongly magnetised neutron star (magnetar) formed in the explosion. Most recently, the group reported their discovery of a previously unseen population of highly energetic transient events in the centres of active galaxies. The group has been actively participating in the extended Public ESO Spectroscopic Survey of Transient Objects (ePESSTO; http://www.pessto.org) which is a large programme running at the ESO New Technology Telescope (NTT) and has been co-leading the Nordic optical telescope Unbiased Transient Survey (http://csp2.lco.cl/not/) a large programme running at the NOT. The main topics of the research in extragalactic astrophysics are the observations of active galactic nuclei (AGN) in the very-high energy domain with the MAGIC Cherenkov telescopes situated at La Palma, preparation for the Cherenkov Telescope Array, observations of AGN jets at the radio and sub-mm range with OVRO, RadioAstron, and ALMA, studies of the AGN host galaxies, and galaxy evolution. The research on the Solar System was concentrating on the studies of the comet 67P/Churyumov-Gerasimenko. We have observed the comet with the NOT to determine the evolution of its morphology. We also are part of the team that studies the cometary dust with the COSIMA instrument on-board of the ESA’s Rosetta mission. The main goal was to determine chemical composition of the dust. In collaboration with the biochemistry department we also studied cyanobacteria suitable for oxygen production and human consumption for Mars mission in low pressure CO2 atmosphere. Recent discoveries by LIGO/Virgo collaborations of the gravitational wave signal from merging of binary black holes opened the new era in studies of evolution of compact stellar remnants. However, the black hole mergers do not produce any visible electromagnetic signal (except a fake signal “detected” by Fermi gamma-ray observatory and advertised by NASA). The situation is different for the merger of neutron stars. Thousands of astronomers all over the world were involved in the campaign to search and study electromagnetic signals at different wavelengths from the so called kilonova associated with such a merger and triggered by the gravitational wave signal detected by LIGO/Virgo on 2017 August 17 in the galaxy NGC 4993 at the distance of 40 Mpc. The astronomers from Turku contributed to the spectroscopic study of the optical counterpart with ESO telescopes. The comprehensive observations showed that the kilonova’s emission is powered by radioactive decay of r-process nuclides (the r-process is a series of neutron capture reactions that synthesize many of the elements heavier than iron). The kilonova produced a significant amount of such heavy elements as predicted by theoretical calculations. This extraordinary event marks the dawn of an era where electromagnetic radiation is now used together with GW emissions to probe deeper and advance our understanding of the Universe. The light curves from the gamma-ray burst observed the Fermi/GBM (upper panel) and INTEGRAL/SPI-ACS (lower panel) together with the gravitational wave signal observed by LIGO (middle panel) on 2017 August 17. The papers involving Turku researchers about the event were published in Abbott B.P. et al. 2017, Multi-messenger Observations of a Binary Neutron Star Merger, ApJ Letters, 848, L12 and Smartt S.J. et al. 2017, A kilonova as the electromagnetic counterpart to a gravitational-wave source, Nature, 551, 75. Credits: LIGO/Virgo, Fermi, INTEGRAL, NASA/DOE, NSF, EGO, ESA. Neutron stars (NSs) contain the most extreme forms of matter available in the Universe. They also serve as astrophysical laboratories to study physics under extreme conditions of strong gravity, ultrahigh densities, super-strong magnetic fields and high radiation densities. The densities in NS interiors can exceed the density of saturated nuclear matter (about 3 x 1014 g/cm3) by a large factor. One of the goals of modern physics is to understand the nature of the fundamental interactions. NSs serve as excellent natural laboratories to study strong interactions and to determine the most important properties of matter in atomic nuclei and NSs. The theory of quantum chromodynamics, which can, in principle, treat strong interactions, is computationally intractable for multi-nucleon systems at NS densities. Instead, physicists have developed empirical models of nucleonic interactions, which make conflicting predictions. Laboratory experiments and NS observations are vital to test these theories and drive the progress. Constraints on the mass-radius of the neutron star in low-mass X-ray binary 4U 1702−429. From Nättilä et al., 2017, Atmosphere model fits of thermonuclear X-ray burst cooling tail spectra: new neutron star mass and radius constraints using Bayesian hierarchical modeling, A&A, 608, A31. NSs observations can be used to place constraints on strong interactions because the forces between the nuclear particles set the stiffness of NS matter. This is encoded in the equation of state (EoS), the relation between pressure and density. For a given NS mass M, the EoS sets its radius R via the stellar structure equations. By measuring the M-R relation, we can recover the EoS at supranuclear densities, which is of major importance to both fundamental physics and astrophysics. It is central to understanding NSs, supernovae, and compact object mergers including at least one NS. To distinguish among the models of strong interactions one needs to measure NS M and R to a precision of a few per cent for several NSs. We have developed methods to measure NS parameters from the evolution of X-ray spectra observed during thermonuclear explosions at the NS surface known as X-ray bursts. Our results show that the radius of a NS in low-mass X-ray binary 4U 1702−429 is about 12-12.5 km. This is consistent with the recent constraints coming from the gravitational wave signal of the NS merger event GW170817, which gives bounds to the NS tidal deformability. Ultraluminous X-ray sources (ULX) are the bright sources observed in the nearby galaxies and not associated with their nuclei. For long time it was believed that these are either intermediate mass black holes or stellar-mass black holes accreting at highly super-Eddington rates. Recently, using Nustar observatory coherent pulsations were discovered in a ULX X-2 in the galaxy M82. By 2018, pulsations were discovered in at least four more ULX. Also similarly bright outbursts were seen from X-ray pulsars in the Small Magellanic Cloud. Thus it became clear that a large fraction of ULX are in fact neutron stars with strong magnetic field. The emission from these neutron stars can exceed their Eddington limit (when radiation pressure balances gravitational attraction) by orders of magnitude. The main questions in this field are: how super-Eddington luminosities are produced, what is the geometry of the source and whether there is any beaming, how strong is the magnetic field? We have discovered strong evidence for magnetar-like magnetic fields in the first ULX-pulsar, source X-2 in M82. According to the Chandra data, the source shows strong variability in the X-ray by switching from the high to the low state different by a factor of 40 in luminosity and amazingly it does not show any intermediate state. We interpreted these data as evidence for the propeller effect, when the strong magnetic field of the neutron star starts to eject accreting gas when the accretion rate drops below some limit when the magnetospheric radius exceeds the corotational radius (where the disc rotates with exactly the same angular velocity as a neutron star). The observed relation between this limiting luminosity, the pulsar period and the magnetic field allowed us to measure neutron star magnetic field, which turned out about 3x1013-1014 G, depending on the model used to relate the magnetospheric radius to the accretion rate. Understanding the nature of ULX-pulsars and the physics of accretion onto strongly magnetized neutron stars is our ultimate goal. Upper figure: Chandra images of the galaxy M82. The source X-2 shows two states: the dim (on the left) and the bright (on the right). Lower figure: The light curve of M82 X-2 as seen by Chandra. The bimodality of the luminosities is clearly seen in the histogram shown in the middle panel with peaks at about 1040 and 3×1038 erg/s. The dependence of the X-ray luminosity on the accretion rate with the discontinuity associated with the propeller effect. From Tsygankov et al., 2016, Propeller effect in action in the ultraluminous accreting magnetar M82 X-2, MNRAS, 457, 1101. Using observations from the Panoramic Survey Telescope and Rapid Response System 1 (Pan-STARRS1) and the NOT, the team in Turku discovered an extremely energetic transient PS1-10adi close to the centre of a galaxy at a redshift z = 0.20. The total energy radiated by this event was thousand times larger than that of normal core-collapse supernova explosions. The galaxy nucleus where this event has taken place hosts a 10-million-solar-mass supermassive black hole, but the event could not be associated with a normal outburst of a supermassive black hole because of its slow evolution and persistently narrow lines. The observed properties imply powering by shock interaction between expanding material and large quantities of surrounding dense matter. Plausible sources of this expanding material are a star, that has been tidally disrupted by the central black hole, or a supernova. Both could in principle satisfy the energy budget. For the former, we would be forced to invoke a new and hitherto unseen variant of a tidally disrupted star, while a supernova origin relies principally on environmental effects resulting from its nuclear location. Remarkably, the team also discovered that PS1-10adi is not an isolated case and therefore surmise that this new population of transients has previously been overlooked due to incorrect association with underlying central black hole activity. (A) Absolute light curve comparison including the luminous nuclear transient PS1-10adi, super-luminous supernova SN 2006gy, tidal disruption event PS1-10jh, and the luminous nuclear transient ASASSN-15lh. (B) The spectral sequence of PS1-10adi from 8 days before the maximum light to 349 days after. From Kankare et al., 2017, A population of highly energetic transient events in the centres of active galaxies, Nature Astronomy, 1, 865. The ESA Horizon 2000 Rosetta mission reached the comet 67P/Churyumov-Gerasimenko in August 2014. The main issues to be addressed by this mission have been the composition, origin and structure of this comet and the orbital evolution from aphelion to the onset of activity and past the perihelion until the comet approached the inactivity and quietness of aphelion. The NOT has been used to monitor the comet since 2013 on a regular basis and to discover jets emerging from the comet. The apparent two jets were modelled as an optically thin rotationally induced conical dust structure with the opening angle changing due to geometrical effects and the rotation of the comet. A picture from COSISCOPE, the COSIMA instrument's microscope. This image shows a collection target (1 cm x 1 cm) with dust nucleus from the nucleus up to about mm in size. All this dust is made up of an intimate mixture of 50/50 (in mass) of anhydrous minerals and organic material. Credit: ESA/Rosetta/MPS for COSIMA Team. The Turku team is also part of COSIMA, which is a time-of-flight mass spectrometer on-board of Rosetta. The instrument collected gently in-situ dust particles from the comet on gold or silver substrates, photographed them with a microscope (see Figure below), and analysed with the spectrometer. Mass spectra of the top layers of the selected particles were measured and transmitted to Earth. The main results are that organic (CHNO) molecules are abundant and the dust particles consist of about equal amounts of carbon rich organic molecules and anhydrous minerals. The presence of the high quantity of organic molecules suggests that comets are a possible means to deliver molecules needed for the onset of life on the young Earth and Mars. This does not imply, however, that comets contain life. VTT is one of the leading research and technology organisations in Europe. We use our research and knowledge to provide expert services for our domestic and international customers and partners. We cooperate with our customers to produce technology for business and build success and well-being for the benefit of society. VTT personnel is 2,109 (31.12.2017) and Net turnover 153 M€. VTT is part of Finland's innovation system and operates under the mandate of the Ministry of Employment and the Economy. VTT has a long history from 1980’s on space projects with EC, ESA and private and public companies. These space instrumentation and remote sensing projects link to all the strategic research areas of VTT: Climate action, Resource sufficiency, Good life, Safety and security, and Industrial renewal. Below examples on current space instrumentation and remote sensing projects. Small satellite industry is growing rapidly and making leaps in technological advancements in comparison to the traditional space industry. VTT’s hyperspectral imaging technology has potential to allow development of novel applications and services from large nanosatellite constellations to provide real-time situational awareness. In recent years, VTT has developed several hyperspectral imager payloads for small satellite missions based on tunable piezo-actuated FPI filters, which can be realized for various different wavelengths from ultraviolet to thermal infrared to enable different application needs. Instrument size is typically very small (0.5U) and light-weight (< 600 g). VTT’s unique 2D snapshot hyperspectral imagers are especially suitable for nanosatellite missions, as the whole 2D scene is imaged at once and the spectral data cube is constructed by taking multiple images of the same target at different wavelengths. Thus, this method is more spatially robust than traditional push-broom instruments in larger satellites. Another key advantage of the technology is that it is software programmable - same spectral sensing hardware can adapt to different application needs through programming of the wavelength selection even after launch. VTT has already realized three payloads: The first visible - VNIR demonstrator for imaging between 500 nm and 900 nm has been launched on-board the Aalto-1 and a similar concept has also been develop for sun occultation mission on nanosatellite on board Belgian PICASSO nanosatellite, aiming for launch in 2018. VTT has also realized world’s first CubeSat-compatible miniaturized hyperspectral imager for SWIR region, for the wavelengths between 925 - 1400 nm (1000 - 1600 nm) to be launched to space in 2018 Reaktor Hello World CubeSat mission. Due to the small size, it is easy to combine multiple different wavelength ranges into single satellite, from 500 up to 3000 µm range. This makes it possible in future to map composition of asteroids, which is future interest of the potential ASPECT mission. Currently, VTT is involved in UV-range spectral instrument development for ESA ALTIUS mission to allow gathering essential time-series data about atmospheric gas composition. The on-going earth observation programs, in particular the European Copernicus program and commercial satellite missions that provide imagery with sub-meter accuracy, offer global image acquisitions more often than weekly. Huge data volumes make it possible to get information from the state of the forest anywhere in the world from satellite images with the help of machine learning and AI tools. We develop advanced interpretation methods and image analysis systems mainly related to forestry. The results are introduced to user community. We are leading the Forestry Thematic Exploitation Platform (http://forestry-tep.eo.esa.int/), which is designed to answer the needs that have emerged from the dramatically increased data supply. The cloud platform offers an online working environment and services, with a broad spectrum of means to turn satellite data to value adding information products. The platform can be used by academic, public and commercial sectors to offer readily made products, services or tools to their customers. On operational forest monitoring side, we have been developing EO based forest change detection together with Finnish SME called Satellio (http://www.hakkuut.fi). The project is funded by Finnish Ministry of Agriculture and Forestry. Below an is example of change detection result in Finland. Forest remote sensing by VTT and Satellio. Millimetre Wave Laboratory of Finland – MilliLab, established in 1995, is a joint laboratory between VTT, Technical Research Centre of Finland and Aalto University. MilliLab is also a European Space Agency, ESA, External Laboratory on Millimetre Wave Technology. Its main purpose is to support European space industry to meet the demands of future ESA missions, which will include an increasing number of millimetre wave instruments for astronomical and remote sensing applications. MilliLab supplies services at millimetre wave frequencies in the field of device modelling, device characterisation, measurements, testing, research, and development. The parent organisations of MilliLab, VTT and Aalto University have a substantial amount of experience and expertise in the field of microwave and millimetre wave technology. The total research personnel with experience in millimetre waves is over 50. MilliLab organised in June 2016 an international joint conference of 9th Global Symposium on Millimeter Waves GSMM2016 and 7th ESA Workshop on Millimeter-Wave Technology and Applications in AALTO university, Espoo. MilliLab has continued to work in MetOp Second Generation activities. The MetOp main three instruments together contain a large number of micro to millimetre wave channels from 23 to 664 GHz. MilliLab is currently involved in several channels from 50 GHz upwards in a supporting role. MilliLab’s work in MetOp-SG concentrates on activities related to RF performance and reliability testing of the critical LNA and diode components. Furthermore, MetOp Microwave Sounder and Microwave Imager 89 GHz radiometer front-end receivers are being built in Finland by DA-Design Ltd. MilliLab performs the RF performance testing of the units for DA-Design. In 2017, the work concentrated on the Breadboard model receiver characterisation, and it has continued with the Engineering Qualification Model during 2018. In addition to MetOp work, MilliLab is participating in the European Components Initiative via ESA projects together with European space industry. Related to MetOp SG receiver technology, in 2016-17 MilliLab has characterized low-barrier Schottky diodes for millimeter-wave mixer application in collaboration with ACST GmbH. Low-barrier Schottky diodes have recently been intensively studied and developed especially for detector applications. When operating as mixers, these diodes require only very little LO power, but have the drawbacks of poor conversion efficiency and noise temperature. In this research activity, with some low-barrier diodes fabricated by ACST, good conversion loss performance was achieved at 183 GHz with LO power as low as 100 microwatts; however, the mixer noise performance was not as low as desired. LNA modules under mechanical tests during preliminary reliability assessment for MetOp-SG radiometers. The University of Jyväskylä with its six faculties is one of the largest universities in Finland. The Department of Physics (JYFL) is part of the Faculty of Mathematics and Science, and the Accelerator laboratory (JYFL-ACCLAB) is part of JYFL. The Laboratory’s research covers experimental subatomic and material physics and their applications. JYFL-ACCLAB has operated very successfully as a Centre of Excellence (CoE) of the Academy of Finland years 2000-2017 and is part of its Roadmap 2020 programme. It is one of only two Physics and Technology national-level research infrastructures listed by the Ministry of Education and Culture and has also been designated by the ministry as a center of expertise in radiation- and ion-beam research, education and applications. It operates in close collaboration with the Helsinki Institute of Physics (HIP), and it has been supported as one of the large research infrastructures from EU-FP4 to Horizon2020 since 1996. JYFL-ACCLAB includes also the Radiation Effects Facility, supported by ESA. The increased demand in radiation testing for European satellite projects attracted ESA to the JYFL-ACCLAB in 2004, when an ESTEC/Contract No. 18197/04/NL/CP: ”Utilization of the High Energy Heavy Ion Test Facility for Component Radiation Studies” between ESA and JYFL was signed. After the upgrade RADEF was qualified to one of ESA’s External European Component Irradiation Facilities (ECIF) serving ESA and the European satellite and aerospace industry for irradiations and research projects in these fields. This contract has been extended several times, and the latest 3-year extension will be signed in summer 2018. Overview of RADEF’s beam lines. RADEF’s specialty is to provide high penetration heavy ion cocktail beams, protons in wide energy range and energetic electrons. For these the RADEF group utilizes combination of JYFL’s ECR ion sources and K-130 cyclotron, and the LINAC electron accelerator. Because in the emerging technologies the integrated circuits have become more susceptible to radiation, the group is expanding its research activities toward the radiation effects in avionics and ground level systems (see the RADSAGA project below). RADEF has a wide network of collaborators worldwide, e.g. ESA, NASA/GSFC, Vanderbilt University (USA), CERN, and STMicroelectronics, to name a few. RADEF provides its services to companies, institutes and universities in the radiation effects community. Since the start of the activities over 80 different collaborators have tested their electronic components at RADEF. Each year there are visits from more than 20 different groups, totalling with more than 40 individual test campaigns. The beam time used in radiation effects testing is about 800 hours annually, i.e. about 13% of the total accelerator beam time at JYFL-ACCLAB. The project RADSAGA (RADiation and Reliability Challenges for Electronics used in Space, Aviation, Ground and Accelerators) will, for the first time, bring together the European industry, universities, laboratories and test facilities to educate 15 PhD’s about electronics exposure to radiation. Three of these PhD students will graduate from JYFL, two are hosted by RADEF and one by CERN. The project spans over the years 2017-2021, and the kick-off meeting was held in April 2017. This project was granted with total of 3.9 M€, and it is coordinated by CERN. The RADEF group is one of the seven beneficiaries. 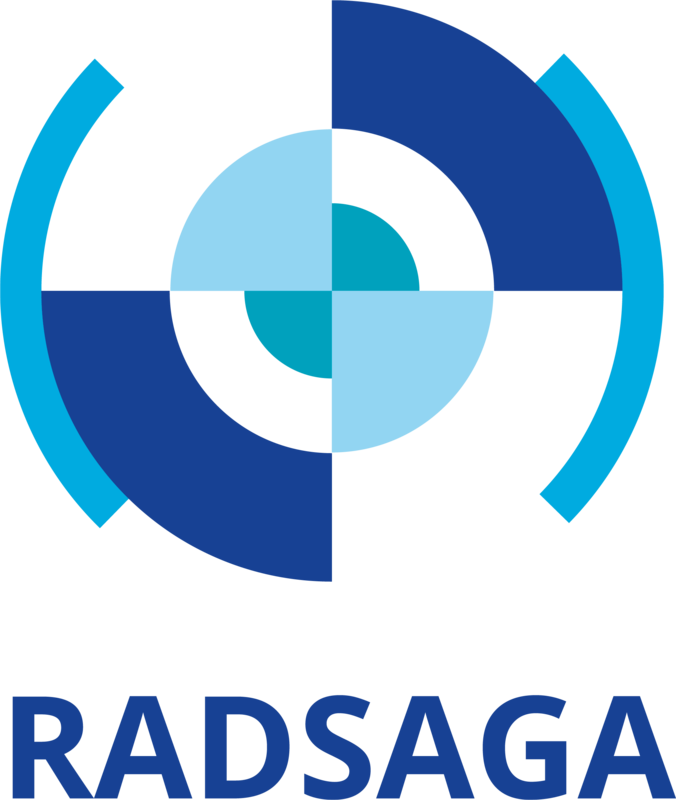 Fourteen other partners, mainly companies and research laboratories, take part in the RADSAGA consortium. The growing complexity in modern electronic technologies raises the requirements for beam energies as the ion beams have to penetrate deeper into the devices in order to reach the sensitive layers. Due to this ESA has provided funding for RADEF to develop higher energy beams for electronics testing. A new 18 GHz ECR ion source HIISI is under commissioning at the JYFL-ACCLAB. The main purpose of HIISI is to increase the energy of high-energy beam cocktails from 9.3 MeV/u to above 15 MeV/u for radiation effects testing of electronics with the K130 cyclotron (see the proposed 16.2 MeV/u ion cocktail in Table 1. below). In the present 9.3 MeV/u cocktail the highest energy is obtained with the Xe35+ ion beam. In order to meet the requirement of the project (≥ 15 MeV/u) the charge state of at least 43+ has to be produced in the case of xenon. In addition, the intensity on the radiation target has to reach the value of 106 ions/s. The afore-mentioned requirements are far beyond the performance of the JYFL 14 GHz ECRIS and have been met so far only by the superconducting ECR ion sources. The 16.2 MeV/u cocktail proposed to be used at JYFL (Final goal). The first test with the final 36-segment sextupole will be performed during the summer 2018. The objective of test is to reach 106 ions/s for Xe44+ ion beam. Another recent ESA-funded development project at RADEF has been the introduction of a LINAC electron accelerator (see figure 3). One main objective for this equipment is to test electronics for ESA’s JUICE mission. With the LINAC accelerator both high energy electron (from 6 to 20 MeV) and gamma-ray beams can be produced. The thermal nanophysics group at NSC led by prof. Maasilta has been at the forefront of superconducting bolometric radiation detection for some time now, starting with several ESA funded projects in the mid 2000’s, followed by several TEKES funded projects in 2010s. The focus has been on transition edge sensor (TES) technology, both sensor and application development, in collaboration with JYFL accelerator laboratory, the Quantum Sensors Group at NIST Boulder laboratories and VTT Micronova. In particular, we successfully designed and fabricated large 256 pixel X-ray TES arrays with novel designs from Mo/Cu bilayers (Fig. 4), on 6-in wafers at VTT’s Micronova clean room facilities. Such large X-ray TES arrays can only be fabricated at a couple of national laboratories around the world. (a) A photograph of the JYU/VTT 256 pixel X-ray TES array and (b) micrograph of one pixel. TES bolometers and calorimeters are currently the most widely used and most developed ultrahigh sensitivity and resolution technology, with many projected applications in future space science missions for far-infrared and X-ray satellite missions such as SPICA (ESA/JAXA), ATHENA (ESA), Origins Space Telescope (NASA). We have also recently initiated a study of advanced superconducting detector technology based on phononic crystal structures in collaboration with NASA Goddard Space Flight Center, with targeted applications for far-IR bolometry. These promising developments are still in the early phase and are based on the groundbreaking demonstrations of coherent modification of heat transport performed in our group earlier. In addition to working on the more developed TES technology, the group is also a member of the new EU FET-open project SUPERTED (2018-2022), where a totally new type of thermoelectric superconducting bolometer will be demonstrated, with also potential for space applications. The Living Report is continuously updated with submissions from the Finnish space research community. The submissions are expected to be reviewed by unit/department leads, and will be reviewed by the editors. Pointing out any possible errata is more than welcome. Submissions shall contain plain text, with possible hyperlinks and references (including digital object identifiers (doi's) annotated and graphics and multimedia attached or otherwise relayed. Graphic submissions shall be in a browser-compatible format (bitmaps: .png, .jpg, .gif; vector graphics: .svg). In case of multimedia submissions, embedded streaming content from a third-party service is preferred. With all graphics, the quality shall be good, with a maximum resolution of around 800 pixels (no limit for streaming services).